BALL-SNP is a software tool based on the Biochemical Algorithms Library (BALL), a molecular modeling framework, providing robust and sophisticated algorithms on structural bioinformatics. 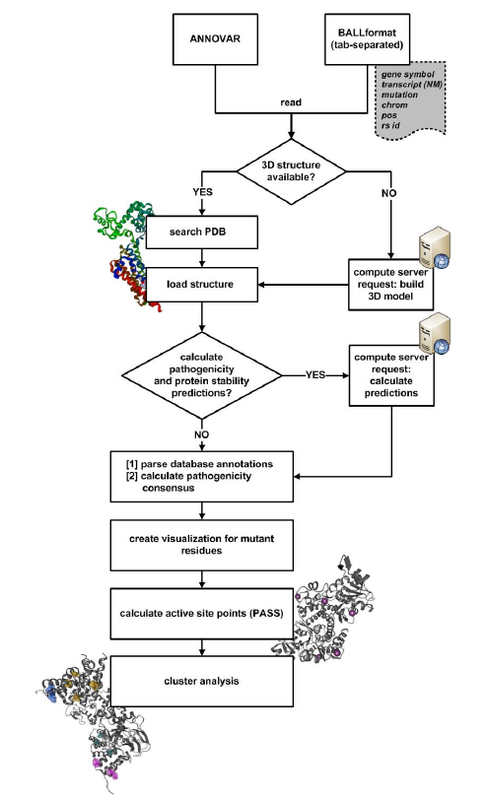 BALL-SNP enables the assessment of multiple non-synonymous single nucleotide polymorphisms (nsSNPs) in a single protein by visualizing the mutated residues within the wild type structure, collecting available pathogenicity information from different databases and predicting binding pockets as well as protein stability changes. Based on the generated information and the three-dimensional visualization, a user can assume whether the amino acid substitutions can have a quantitative effect due to mutual interaction or have an influence on binding and stability. An input file containing nsSNP data can be loaded via the button in the menu. Exemplary data and its analyses can be found here. For a better understanding of BALL-SNP and its functionality, we will provide videos showing the above described examples.